CM N Chandrababu Naidu participated in the event and lighted the special diya, containing one crore wicks. 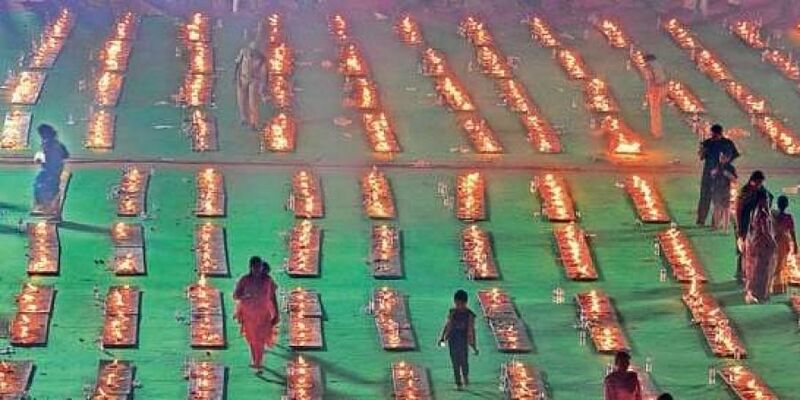 VIJAYAWADA: Hindu Dharma Parirakshana Trust and Endowment department have jointly organised Koti Deepotsavam on the final day of karthika masam at Indira Gandhi Municipal Corporation Stadium on Thursday. Priests from Srisailam temple performed Brahmaramba and Mallikarjuna Swamy Kalyanam, before starting the Deepotsavam. More than 200 priests recited Sanskrit shlokas from the Vedas. “The newly formed State needed all the support and blessings. We are doing our best, but God should show some mercy on us. In the past four years, we had deficit rainfall, but with the interlinking of rivers Krishna and Godavari, we have been saved from agricultural drought,” he said.